Now that the Black Friday shopping season is well and truly underway, we take a look at some pretty important thins that stores shouldn’t do if they want online shopping to grow in Pakistan. Here are 5 things that Pakistani e-commerce stores should absolutely avoid this Black Friday. In ‘Things that seem cute but are really not’, this one practice by e-commerce store takes the cake. An item that normally costs Rs. 1000, is priced at Rs 2000 on Black Friday, only to be sold at Rs 950 under a 55% discount. The dubious math really speaks for itself here. A lot of Pakistani customers are duped into thinking that they are getting massive discounts, when the reality is something else altogether. You must have seen those Facebook posts where people call out online stores who indulge in fake Black Friday discounts. This is the number one reason why shoppers don’t trust Pakistani online stores. This is actually a pretty common practice that most if not all Pakistani e-commerce stores indulge in. A lot of eagle-eyed deal seekers can probably spot an online store’s attempt to fool them by putting their entire inventory on sale. This is as big of a Black Friday scam as they come. The main idea is to deliver a consistent and great user experience for shoppers. Helping them get to the deals helps both you and your store. If you want your customers to trust you better, lets stop with this counter-productive behavior right now. Some stores, in a bid to attract people with ‘never-seen-before deals’, tend to offer a great price for a great product. The reality? They only have limited quantities of the product in stock. So here’s what usually happens. A false impression is created in the minds of buyers. E-commerce stores basically cash in on that short-lived hype, and announce that the deals on their hot product is closed. Only issue? Almost all of the online stores rely on this short-lived (and anti-consumer) tactic. A lot of stores go out of their way to advertise their free shipping policy. So far so good. Some of them do mention terms and conditions in order to qualify for free shipping, which is the correct way to go about it. Others tend to hide their shipping costs until and after the customer has loaded up on their shopping cart. If you want to lose sales at the last possible moment, then please continue with vague sounding shipping policies. Ideally this shouldn’t be the case. Last but not the least, this is a classic mistake that many stores keep on making. The average Pakistani shopper cares about the price and does their due diligence. All it takes is one bad experience to lose a customer forever. Therefore Pakistani e-commerce stores should be doing more to bring out genuinely interesting deals for Black Friday. Do you think we covered the issues more or less? What else should Pakistani online shopping stores be mindful of? Do let us know in the comments below. HAJJ Seasons : Why We Chosen Discount for ENGLISH Month & Festival ? Bilkul sahe baat boli hai. Here’s a suggestion for Propakistani too. Avoid giving a platform to fraudulent sites just because they offer you money. And my comments were removed even though I wrote the truth about Daraz and buying things from there for almost 2.5 years….now I have stopped as of last month. When I see the price on display picture it is 3599 but when I go to buy it, it becomes 4480, isn’t it looting? Daraz stop it. Daraz is doing this time and since midnight they have changed the shipping chargers from 98/- to 150/- and rather then on total kg it is on each items. different rate for 5-10k and 10k n above. Thats more like it ProPK, shukar hai kuch customer point of view se bhi likha. But I agree with one of the comment by @tahanajam:disqus that please stop providing your platform to these fraudster, they will get you some quick money but surely bringing bad name to ProPK. Its a sorrow to see we are still copying western cultures. Despite of this Friday is the holiest day in every week. Regardless of Color there should be Holy Friday Deals. On the contrary, These super sale offers are mostly defected or refurnished or reskinned items which look so good to be true. People should not fall for that. Agreed with most of the points mentioned. However, I would like to point out that most e-commerce websites do not sell the items themselves. They only provide a platform for small and big businesses (called sellers) to advertise their products. I have heard many people blame these websites like yayvo, daraz etc because of their poor experiences with them. But the fact is that these websites, though responsible, are not entirely to be blamed, because mostly it is the seller who advertises and ships the product. I would recommend avoiding the seller with whom you have had a bad experience. Needless to say there are genuine sellers out there with good products and reasonable prices. One of the reasons for increasing the price and then putting the item up on sale with heavy discounts is the promotion requirements for the seller. 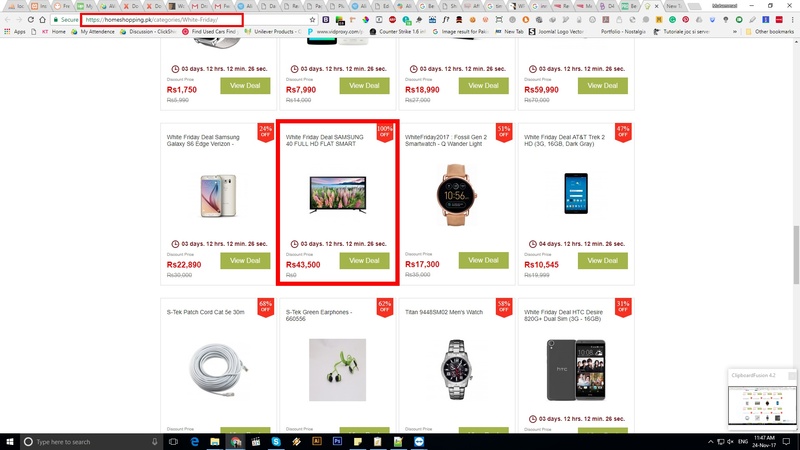 For example, these e-commerce websites put a condition of at least 40-50% discounts on each item for the seller to be included in Black Friday promotion. For the seller there is no option but to increase the original price and apply the 50% discount on it. Also, do not forget that the price one pays for the item (excluding shipment) does not go all to the seller. Part of it (approx. 5 – 20%, depending on item type) goes to the e-commerce website. So to keep getting profits these sellers jack up the prices before any promotion. Having said that it is the websites’ responsibility to monitor the seller and their quality of products. The feedback and rating system like on Aliexpress needs to be implemented to keep fraudulent sellers out. The customers also need to be encouraged to provide feedback on their purchases. Many of them don’t bother rating or commenting the items they’ve purchased. Positive or negative comments both help other customers. Good points! Regarding this: I have been using Daraz for 2.5 years and they often send me deal info e-mail or I get SMS from UBL for 20% off discounts, but when I visit the site on same day, deal doesn’t exist at-all. I raised this concern to customer service and they apologize yet nothing else is done to resolve it with vendors or their partners, i.e. UBL, etc.